Vediamo le caratteristiche principali che la distinguono Ø del disco. 115 mm (no incluido). Disco diam. 115 mm NON INCLUSO. Pilas litio 18 V – 3,0 Ah Power X-Change. Voltaje 18 voltios. Batteria 18 V 3,0 Ah. Einhell RT-MG 10,8/1 Li - Máquina multifunción con batería de litio (10,8 V, batería: 1,3 Ah, incluye maletín Bmc). Profundidad de corte 28 mm,1 velocidad. SIMPLICIDAD Y SEGURIDAD. The Einhell TE-AG 18LI Power X-Change Angle Grinder is a very handy, compact tool and is the lightest angle grinder of its class. The Einhell TE-AG 18 Li Kit Power X-Change Angle Grinder is supplied with. 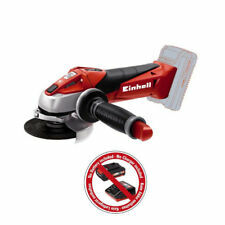 Einhell Cordless Angle Grinder Power X Change 18v Li-ion Stock Code: EINTEAG18LI BARE UNIT - NO BATTERY OR CHARGER INCLUDED Power X-Change is the rechargeable battery system from Einhell. It is designed for multi functionality. With this advanced technology, you can use 18V rechargeable batteries with different capacity ratings to power any of the Einhell Power X Change range. The Einhell TE-AG 18Li Power X-Change Angle Grinder is a very handy, compact tool and is the lightest angle grinder of its class. It has a robust aluminium gear housing and a very smooth operation thanks to separation of motor and gearing. The soft-start function and restart safeguard make it safer to use and there is an overload cut-out for a long service life. The modified air guidance provides . POWERFUL, WIRELESS & COMFORTABLE: These are the features that gave great importance during its design. 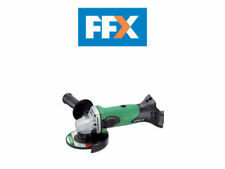 The angle grinder is part of the Power X-Change family, so the battery can be used in all standalone devices in the series. 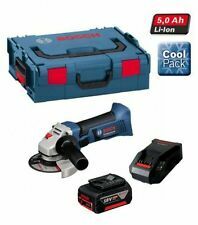 Einhell Cordless Angle Grinder Power X Change 18v Li-ion Kit Stock Code: EINTEAG18LIK Power X-Change is the rechargeable battery system from Einhell. It is designed for multi functionality. With this advanced technology, you can use 18V rechargeable batteries with different capacity ratings to power any of the Einhell Power X Change range. The Einhell TE-AG 18Li Power X-Change Angle Grinder is a very handy, compact tool and is the lightest angle grinder of its class. It has a robust aluminium gear housing and a very smooth operation thanks to separation of motor and gearing. The soft-start function and restart safeguard make it safer to use and there is an overload cut-out for a long service life. The modified air guidance provides better cooling and the disc guard has a quick. The Einhell TE-AG 18Li Power X-Change Angle Grinder is a very handy, compact tool and is the lightest angle grinder of its class. Our aim is to provide you with top quality products, at trade prices, straight to your door - hassle free. Einhell Expert TE-AG 18 Li solo - Amoladora (sin batería, 18 V, 115 mm, profundidad de corte 28 mm, Power X-Change) rojo. Voltaje: 18 voltios. Cambio de hoja de sierra sin herramienta. Estilo: Sin batería. For very smooth operation, the motor and gearing are separated. The modified air guidance ensures optimum cooling of the tool and low strain on the gearing during operation. 1 x Einhell TE-AG 18 Li. The long-lasting housing consists of high-quality, impact-resistant plastics. A practical carry handle provides simple transport. Specification Cutting Width: 33cm. Weight: 11.85kg. Batteries: : 2 Lithium ion batteries required. The Einhell TE-AG 18LI Power X-Change Angle Grinder is a very handy, compact tool and is the lightest angle grinder of its class. The soft-start function and restart safeguard make it safer to use and there is an overload cut-out for a long service life. Einhell TE-AG 18 Li Solo Power X-Change 18 V Lithium 115 mm Cordless Angle Grinder - Black/Red/Stainless Steel. Suitable for the Einhell Power X-Change Battery System. 1 x Einhell TE-AG 18 Li. 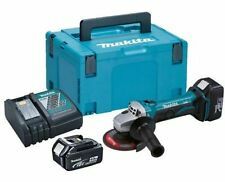 Cutting disk not included The TE-AG 18 Li – Solo angle grinder features a rugged aluminium gearing housing. Einhell TE-AG 18 Li Solo Power X-Cambio de litio de 18 V 115 mm Ángulo Inalámbrico..
Einhell TE-AG 18 Li Solo Power X-Change 18 V Lithium 115 mm Cordless Angle Grinder - Black/Red/Stainless Steel. Suitable for the Einhell Power X-Change Battery System. Cutting disk not included The TE-AG 18 Li – Solo angle grinder features a rugged aluminium gearing housing. Multi Function Tools. Pressure Washers. Accessory Sets. Site Lights & Cable Reels. 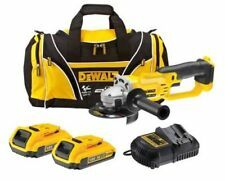 Power Tool Kits. No Load Speed: 8,500/min. 1 x 18 Volt 3.0Ah Li-Ion Battery. Compressors & Air Tools. Einhell 4431113 TE-AG 18 Li Kit Power X-Change 18 V Cordless Angle Grinder with 3.0Ah Battery and Storage Case - Red. Part Number : 4431113. Item model number : 4431113. It is designed for multi functionality. Einhell TE-AG 18 Li Solo Power X-Change 18 V Lithium 115 mm Cordless Angle Grinder - Black/Red/Stainless Steel. 1 x Einhell TE-AG 18 Li. Suitable for the Einhell Power X-Change Battery System. Cutting disk not included The TE-AG 18 Li – Solo angle grinder features a rugged aluminium gearing housing. Einhell 4431113 TE-AG 18 Li Kit Power X-Change 18 V Cordless Angle Grinder with 3.0Ah Battery and Storage Case - Red. 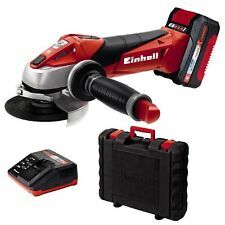 Einhell TE-AG 18 Li Kit Angle Grinder. The TE-AG 18 Li Kit Angle Grinder is the lightest cordless angle grinder of its class and an indispensable helper on many different grinding and cutting jobs.